AN AMERICAN lesbian who took the biological child of her former partner to Australia has sparked a ground-breaking custody battle over their eight-year-old daughter in the Florida Supreme Court. The women, now in their 30s and known in court papers by their initials, were police officers in Florida. One partner donated an egg that was fertilised and implanted in the other. That woman gave birth in 2004, nine years into their relationship. But the couple separated two years later, and the birth mother eventually left the US with the child without telling her former lover. The woman who donated the egg and calls herself the biological mother finally tracked them down in Australia with the help of a private detective. Their fight over the girl is before the Florida Supreme Court, which has not said whether it will consider the case. At issue is a law meant to regulate sperm and egg donation. Scholars debate whether the constitutional right to procreate includes outside-the-body technologies used to conceive. Also at issue are constitutional questions about gay people’s right to raise children and claim equal protection under the law. The biological mother isn’t concerned about being a legal or social pioneer, her Australian lawyer said. She just wants her child back in her life. ”She hasn’t seen her daughter in years, and it’s been terribly difficult,” said Robert Segal, a family lawyer. The birth mother’s lawyer, Robert Wheelock, did not respond to questions. The women agreed to use ”reproductive medical assistance”, have a child and raise that child as a couple, court records show. It’s unknown why they separated, but ”their separation does not dissolve the parental rights of either woman, nor does it dissolve the love and affection either has for the child”, the appellate decision said. The appellate judges reversed him 2-1 in a decision that found the biological mother wasn’t a ”donor” because she and her partner intended to be parents together. In Victoria, this scenario is a surrogacy matter and had not come before the courts, said family lawyer Vanessa Mathews. Non-commercial surrogacy became legal in Victoria only last year. Ms Mathews said disputes over the living arrangements of children conceived through IVF procedures are ultimately matters to be determined under the Family Law Act, a national law. A trial judge ruled for the birth mother and said the biological mother has no parental rights under state law, adding he hoped his decision would be overturned. 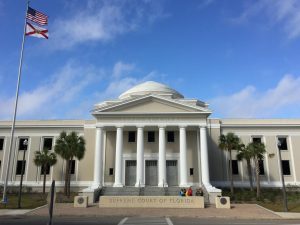 The 5th District Court of Appeal in Daytona Beach obliged, siding with the biological mother and saying both have parental rights. The Trial Judge is the Judge or Judicial Registrar hearing the Trial of a case.